For those of you who might think the aviation industry lacks the glitz of a Hollywood gala, then you obviously haven’t experienced the electricity brought on by the introduction of a new aircraft. Such an experience becomes even more dramatic when that event takes place in an exotic city in the Middle East. 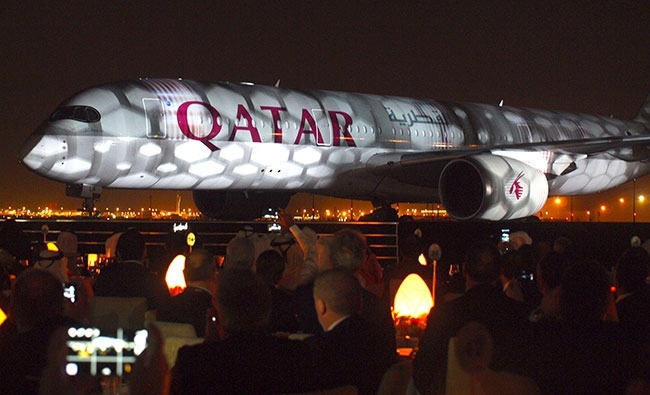 Those lucky enough to get an invite to the early January introduction of the new Airbus 350 XWB with launch customer Qatar Airways in the capital city of Doha, experienced just such a spectacle. More than 150 aviation journalists from around the world were given a first-hand peak at the aircraft, as well as city tours, a spectacular evening dinner cruise on a traditional dhow and a variety of other activities – including a vivid, 40-minute 3D presentation on Qatar’s 2022 stint as host of the World Cup. Ah, the beautiful game in all its glory. And it didn’t end there. On the night of the unveiling, the A350 XWB debuted to a brilliant light show, followed by music, dinner and more aircrafts tours. It was an impressive display and my first reaction to the wide-eyed journalists surveying the new toy was immediately “kids in a candy store” – yes, it was a “selfie” fest to be sure. The event also offered a glimpse into the mysteries of Doha’s unique culture and a more acute understanding of the Qatar Airlines brand, its development as a growing influencer on the world stage and in many ways, the future of aviation itself. The A350 XWB is indeed a game changer in commercial aviation. Made of 53 per cent composite material and some 70 per cent advanced materials combining titanium and aluminum alloys, the aircraft is light, durable and developed with ease of systems to maximize efficiency. With its sophisticated, light-weight design and new wing concept, the aircraft will burn 25 per cent less fuel than aircraft of previous generations, making it solid on the pocket book for operators. Ease of maintenance will also be achieved with the A350 XWB, and the direct benefits from reduced fuel consumption will help lower carbon emissions per passenger. But as Mike Bausor, Airbus A350 XWB marketing director noted during the introductory press, economics is not everything. The aircraft is equally about technological enhancement and enhancing the commercial passenger experience. Developing efficient, dynamic new systems to take commercial passenger travel to a new level is precisely why concept Qatar Airways is gaining a strong reputation on the global stage. Such leadership is critical in the Middle East where competition is fierce and demand is on the rise. The region’s big three international carriers – Qatar Airways, Etihad and Emirates – are rapidly developing as trendsetters on the global stage. Enigmatic Qatar Airlines chief executive officer, Akbar Al Baker has a true passion for aviation. Dynamic, aggressive and confident, Al Baker’s passion for aviation transcends not only Qatar Airlines, but globally. He is actively involved in a number of industry associations and is committed to enhancing international safety standards. His goal is simple and one that makes sense – work to enhance the passenger experience and positively develop global aviation. Oh, yes, there is the bling factor, the glitz of a successful aircraft introduction, for example. But in the end, it’s also about value, transformation and leadership. Your feedback is always welcome. Please contact me at mnicholls@annexweb.com.